By the 5 Skilled Guru Monks!!! Purpose of Making: Lersi Gusalo wants to use his own magical competence to help people who are interested in mysterious powers and donate some money to the temple. Ceremony: This amulet was consecrated by Lersi Gusalo himself. Phaya Khao Kam appears in Thai northern legend. The legend says that once in the past there was the king who did not have a son. The king wanted to have a son, so he held the ceremony to pray to god for son. Soon, the king had a son. His son was very good-looking and had gold horns on his head since he was born. The horns were bigger as he got older. When the prince grew up, he was charming and was wanted by a lot of girl in the town. People called the prince “Phaya Khao Kam” that means “who has gold horns”. Nobody could remove horns on prince’s head, but his soul mate. One day, the prince found two beautiful ladies who were his soul mates. The two ladies could remove horns on prince’s head. The prince no longer had horns. He and his girls lived happily ever after. The story of Phaya Khao Kam is told from generation to next generation. The magical master creates an amulet after Phaya Khao Kam intending to build up love power. Lersi Gusalo is a hermit living in Nakhon Ratchasima Province. He got ordained as a Buddhist novice when he was 18 and as a monk when 20. Lersi Gusalo, at that time, was so interested in meditation. He meditated with a senior monk whom he learnt how to keep mind still while meditating. Later, he resigned from monkhood and became a hermit. However, he continued practicing meditation. He seriously practiced as a hermit in the woods. He also went to many magical institutes to learn astrology and fortune telling using science of gypsy and Tibetan cards. He went to many guru monks to learn mantras. Soon, he understood what he studied. At present, Lersi Gusalo often goes to the woods according to hermit’s style. Purpose of Making: Proceeds go to the temple for development and restoration. Ceremony: Abbot and monks of Wat SriBoonRueang together blessed this amulet on the holy date and time. **Experience: People who have worshiped this Guman Thong say that Guman Thong helps them run a business well and gain windfall. Wat SriBoonRueang is a well-known temple in Khon Kaen Province. This temple is famous for LP Khiew, a sacred guru monk in the past. Amulets by LP Khiew are regarded powerful. Ceremony: LP Samon consecrated this amulet by himself. 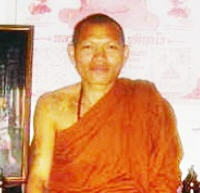 LP Samon is a well-known guru monk in Kalasin Province, northeast of Thailand. He finished Khmer and Laotian magic and art of making effective amulets. He is a disciple of Yatan Gammatan Paeng, superb past Laotian guru monk. He also went to learn more magic from other guru monks until he became an expert. His amulets are famous for charm, protection and wealth. Ceremony: LP Noi fully consecrated this amulet by himself. LP Noi (monk name: LP Wirat Tawahro) stays at Wat Sri Sorngkorn in Sisaket Province, the northeast of Thailand. He spends most time on a pilgrimage. He had been in Cambodia for 6 years. He has Lersi spirit in himself. He learnt magic from many magical experts both monks and guru masters. His amulets are very powerful. If you want to experience real power, you have to prove the amulets by yourself. Ceremony: LP Thep fully intensively consecrated this amulet by himself for 9 months spelling Katha for more than 1,000 times. LP Thep (full name: LP Thep ThepInTho) who is a disciple of LP Suang (the most uncommon guru monk in Thai history) is a Buddhist pilgrim monk. His hometown is Nakhon Ratchasima Province. He often travels in the woods and the mountains for mysticism. That is to say, LP Thep steps on almost every region of Thailand. He has ever been on a pilgrimage to Pu Kradueng, Loei Province, Thailand and Pukow Kwai, Laos. LP Thep has been interested in mantras and magic for a long time. He has learnt mantras and magic from many guru adepts. He knows Khmer magic and consecrates amulets very well. With strong magic in his body, he is too energetic that he has to go to many calm places to stay calm. For consecration, LP Thep gives all his skills, energy and soul to build up the great power to what he consecrates. He might spend 1 year on blessing per 1 collection. During consecration ceremony, no one is allowed to enter. LP Thep will not finish consecrating if he feels his amulets are not powerful enough. He does until he is so sure about the power. Ceremony: LP Thep intensively blessed this amulet following traditional procedure. "Items arrived very fine and i just get the katha´s. Let me say Thank You to You and the Staff at Billonmore for doing a very good job there. "